for girls ages 9 – 14. There’s a lot going on for a girl as she grows up and we don’t want her to go through it alone! This FREE 3 week online coaching program of Live Webinars brings girls together to talk about specific and real issues they are facing in their every day lives. 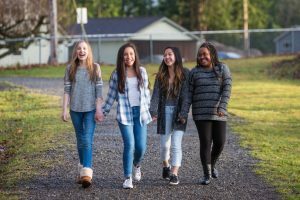 They’ll be able to connect with other girls their own age and hear how their peers are overcoming obstacles, so they can learn from each other and realize they’re not alone. Each interactive webinar will be led by two highly skilled coaches, Tracy and Journey, to encourage the girls to get the most out of each session and walk away with solutions that they can start using right away in their own lives. Tracy and Journey offer new perspectives on the world of girls and how to move toward your confidence and away from your fears. The next program kicks off on Monday, February 27th. Calls are held on Mondays and last up to 1 hour. Video call times are grouped by age. If you can’t make the scheduled time; or your daughter isn’t within the age group Email us and let’s talk about ways to get involved. We are committed to growing this community! Additional call times may be added as needed. **Technical requirements – Calls are facilitated using the free-for-participants videoconferencing service called ZOOM. You can check is out at zoom.us or download the ZOOM app from your app store. An internet connection is required. Please provide the parent’s email address with the registration as well as the best method to contact the daughter. Parents are invited to hang out for the first few minutes of the first call to meet with Journey and Tracy. Have more questions? Email girls@girlschangingtheworld.com or find us on Facebook and we’ll be happy to answer any of your questions.